Remember for whom you work when you enter a career in public service. 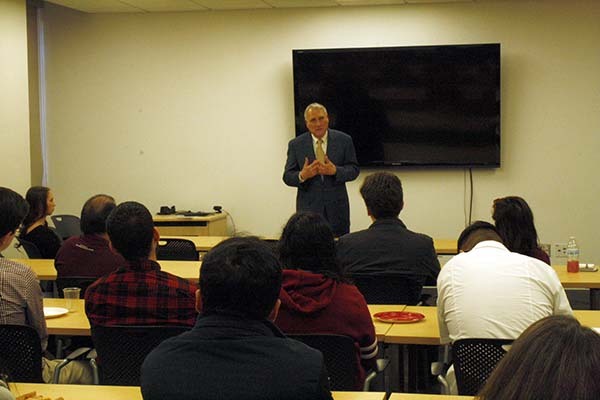 That was the theme of a talk given by former Senator Jon Kyl to students on Arizona State University’s Downtown Phoenix campus. He focused on the role of public service professionals and how those interested in public service careers can succeed. The former senator also shared three skills they should develop if they want to enter public service: writing well, speaking well, and critical thinking. Being able to communicate ideas clearly, he said, is what people who advance in the field know how to do. He continued by saying that if a person has critical thinking, the writing and speaking skills will come naturally. If you have had a standard of excellence in what you’re doing...you are going to be well prepared, and that’s going to put you in a position to take advantage of an opportunity that you maybe had no idea was going to come along,” he said. The informal talk was hosted and organized by the School of Public Affairs, part of the College of Public Service and Community Solutions. Geoffrey Gonsher in the School of Public Affairs helped lead the event. His students in public leadership, leadership capstone and urban governance will be starting their careers in public service within the next year. He says the event was open to all students because the senator's career guidance is helpful to everyone.